Many of us have trouble using patterned border papers for our layouts. They are often haphazard, making it difficult to create a flowing page. To overcome this problem, focus your efforts on the centre of the page. Use linear lines to add some order to your page and incorporate rounded corners to help create a flow between your background and foreground. This layout is an example of how to do just that to create a beautiful page for your albums. Dig out some of your border papers and have some fun. We all have them somewhere! This layout was created using SDU Rainforest paper, NRN Designs green paper from the NRN Designs Tropical Paper Pack, green cardstock, green ribbon, a flower punched from green Bazzil cardstock, green ink and two green leaf brads. 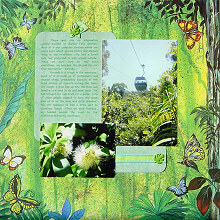 Begin by matting your SDU Rainforest paper on green cardstock. Cut two pieces of NRN green paper. One should measure approximately 11cm by 15cm and the other 7cm by 4cm. Add journaling to the largest piece and place a ribbon across the middle of the smaller piece. Round the corners of your green pieces. This helps create a unity between your haphazard background and the more formal straight edge foreground. Arrange your photos and green pieces as shown in the layout above and adhere. Add a green leaf brad to the right side of your ribbon. Punch a flower from green Bazzil cardstock and ink the edges with green ink. Use a second green leaf to attach it and small piece of ribbon above your journaling, as shown in the layout above. If you would like to have any of your designs included in our resource centre, please email them to us at rc@stickersnfun.com (please make sure all files are .jpg or .gif).